The pulse of a city that lives and breathes music is present in every honky-tonk, every bar and in the warm breeze coming off the Cumberland River. 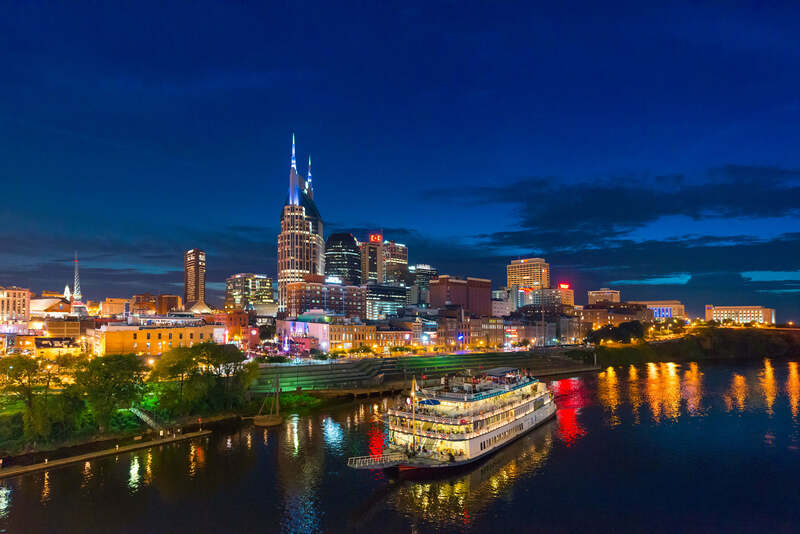 Experience the true heart of Nashville aboard our new Soul of Music City – Nashville’s Night Tour! It’s an evening filled with music, history and fun and a close-up view of some of the most legendary spots in town. Printers Alley, Ryman Auditorium, Municipal Auditorium & Musicians Hall of Fame, Rhythm & Blues heritage of Historic Jefferson Street, Elliston Place “Rock Block”, Music Row, Station Inn, and The Gulch. You’ll explore the places that have set this city apart and the ones that pay homage to the many who have come here looking for fame and fortune. You’ll hear the stories and anecdotes full of the country charm and folksy wisdom that Music City is known for. From the city’s honky-tonks to its famous music venues, uncover insider stories and intriguing facts about the people, places, and events responsible for the city’s iconic reputation. So get ready for an evening of bright lights, history and great music! Just a quick look-see at all the cool stuff you’ll be enjoying! Sit back and settle in as we cruise down world-famous Lower Broadway making our way past all of the most talked about and renowned bars and live music venues in the United States! Note: The trolley does not stop at any of these points of interest except the Pedestrian Bridge. Tootsie’s Orchid Lounge has hosted nearly every singer and songwriter in the industry. Step out the back door into “Tootsie’s Alley” to see the famous back alleyway that performers like Hank Williams & Patsy Cline would walk after performing at the Ryman Auditorium. This Honky Tonk is the undisputed home of traditional country music. From the 50s to the 80s, it housed the Show-Bud Steel guitar company & manufactured and sold some of the best steel guitars ever made. Formerly home to the Boots Randolph Carousel Club, this New Orleans themed bar is one of the best places in Nashville to hear soulful blues music. This record shop was started by Grand Ole Opry Star Ernest Tubb in 1947. You can find Contemporary or Classic Country and even Bluegrass Music here! See the amazing skyline views from the John Seigenthaler Pedestrian Bridge. This pedestrian bridge is a truss bridge that spans the Cumberland River. Is the place to go in Nashville to hear Bluegrass and Roots music. It moved to its current location in 1978 and it remains a hidden musical gem in the growing neighborhood surrounding it. Exit / In was opened in 1971 to serve as a home for musicians of all genres. When you stop by, be sure to check out the names of the legendary artists who have sold out shows at Exit / In on the wall outside the club. Elliston Place is home to some of Nashville's finest parks, legendary venues, trendy nightclubs and the full-scale replica of the Greek Parthenon. Honoring the artists and session musicians who have accompanied legendary performers in a broad range of musical genres. Considered the heart of Nashville’s entertainment industry, the Music Row area is centered on 16th and 17th Avenues South, which are known as Music Square East & West. Points of interest in the district include Historic Studio B and Columbia’s Historic Quonset Hut, the first recording studio on Music Row. Nightclubs are the descendants of the saloons, speakeasies, and clubs which developed into the entertainment district still known as Printers Alley. Known colloquially as the “Mother Church of Country Music,” Ryman Auditorium began as the Union Gospel Tabernacle. Local entrepreneur Thomas Ryman built it as a permanent location for tent revival-style gospel meetings. The Gulch is a historic neighborhood located south of downtown with a hip atmosphere. Today, it is the setting for renovated warehouses that feature residential and office spaces as well as a variety of upscale restaurants. Unlike any city in the world, music is deeply rooted in the heart and soul of Nashville. The city’s earliest settlers arrived with little more than instruments in their hands and a song in their heart. Perhaps you’ve heard the names: Dolly Parton, Steve Earle, Willie Nelson, Zac Brown, Jimi Hendrix and Johnny Cash. They followed a dream and together, they paved the way for the dreamers that followed. From the early days of the 20th century with its fiddles and banjos to the flash and pomp of the 1960s and 70s glory days, to today’s polished pop country and rootsy, underground sounds, Nashville keeps turning out the hits and proving it deserves to be called Music City. Whether you’re looking to cut a rug listening to some cracklin’ good rockabilly or finding just the right armadillo boots to give your dad for his birthday, these great spots have received our stamp of approval. Here’s all that small print stuff you may want to look over. *Tour length may vary depending upon road conditions or traffic. Pedestrian bridge portion of the tour is traffic and weather permitting. **Please Note: Must be 18 or older to join the tour. Complimentary beverage may be chosen from selected items. Must be 21 or older to consume alcoholic beverages. Photo ID is required for all guests. The downtown area has numerous parking opportunities in paid lots. There is no designated free parking to board the tour. Reservations for accessible Trolley must be confirmed 24-Hours in advance. Please call customer service at 629-208-0200. Music City isn’t just a feast for the ears.